Warmer weather is approaching, which means it’s time to get your body “ready” for summer. Of course, while getting “bikini-ready” does come to mind, there’s one other thing to keep in mind: the necessity to prep your feet for summer sandal season. In the hotter months of the summer, it’s not just our arms and legs that are exposed to the elements — our feet also take a beating. Learning how to prepare your feet for the dry and hot summer, and how to keep them happy throughout, can make for a much more enjoyable, and beautiful swim, sand, and sun season! Nothing ruins a cute summer outfit like some dry, cracked feet, so follow these simple tips for maintaining optimal foot health this summer. Sandals, flip flops, flats, bare feet — most go-to summer footwear styles don’t offer much in the way of arch support. Don’t worry, no one’s trying to make a case for wearing comfortable tennis shoes with insoles at the beach, but there are ways to choose your summer shoes wisely. When shopping for your new summer shoes, always opt for a pair that feels comfortable immediately, as opposed to a style that might need to be broken in. Strappy sandals and flip flops are great when they’re comfortable, but the break-in process can be painful and leave your tender feet filled with blisters and raw spots. Though it may be hard to resist a flat and simple pair of sandals or flip flops, always consider choosing a pair of shoes with at least a little bit of support if you’re planning on wearing them for extended periods of time. The flat and thin bottoms of many summer style shoes can cause stress fractures, hammer toe, heel pain, and tendonitis. Investing in even one supportive pair of summer sandals to give your feet a break from the constant pounding of flip flops or flats can do wonders for your feet this summer. 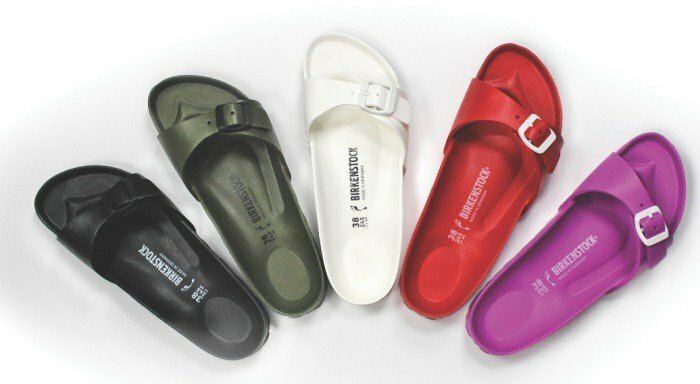 Try a pair of comfortable and supportive Birkenstock sandals to add to your summer collection. The new EVA collection is affordable, bright, and perfect for a day at the beach or pool. The constant wear of shoes with open backs can flatten and crack your heels with time. Maintaining a daily moisturizing routine can help slow or stop this process from occurring! Try treating your feet and heels to an exfoliating moisturizer or lotion before bed. If you notice your heels are looking very dry, try applying moisturizer and putting socks on before falling asleep a couple of times a week to attain a deeper level of care. Sometimes, heels can become so dry that they crack, leaving painful and often bloody gashes in the skin. In this case, be sure to use antibiotic oil and protect the area with bandages to trap in the moisture. You can also try using a pumice stone in the shower to rub off some extra dead skin. Be sure to rub lightly and only in one direction, as you don’t want to cause more harm! Though a nice foot soak might sound like the perfect fix for your dry feet, it could actually be more damaging. Instead of drying out your skin more, stick to an exfoliating and moisturizing treatment. In addition to dry feet during the summer, sometimes the heat can cause the opposite problem: sweat. Embarrassing odor and discomfort aren’t the only problems associated with overly-moist feet, they can also leave you prone to infections or fungus. 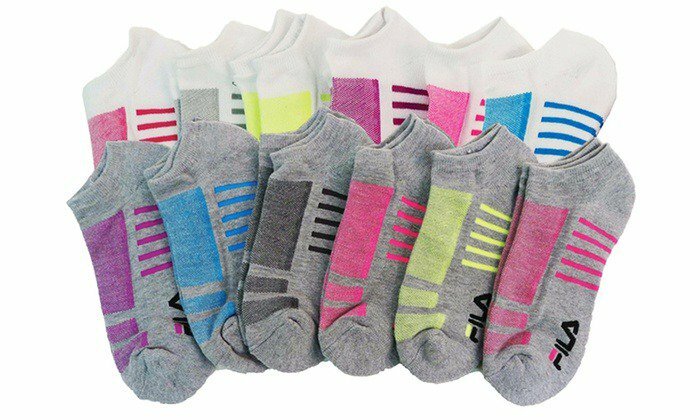 Make sure to grab some moisture-blocking socks for the summer months, and replace damp socks with dry ones right away to avoid harmful infections. Going outside in the sun unprotected is an obvious health risk. Remembering to throw on a hat or layer some sunscreen might be common sense for many people, but don’t forget about your feet! Every part of the body is susceptible to sun damage, and this includes the feet, toes, and even toenails. Because nails are made of protein, they can be just as sensitive to the sun as the rest of your body, so be thorough with your sunblock. Make sure to seek shady places when possible, and always apply a layer of sunscreen to your feet to help avoid sunburn and skin irritation. Because your feet are used more often and more heavily than other parts of your body, a painful sunburn can be really debilitating. Stay healthy and foot-focused by remembering to apply the same principles of skin sun care to your feet as you do your body. But, there’s no need to be boring about it. 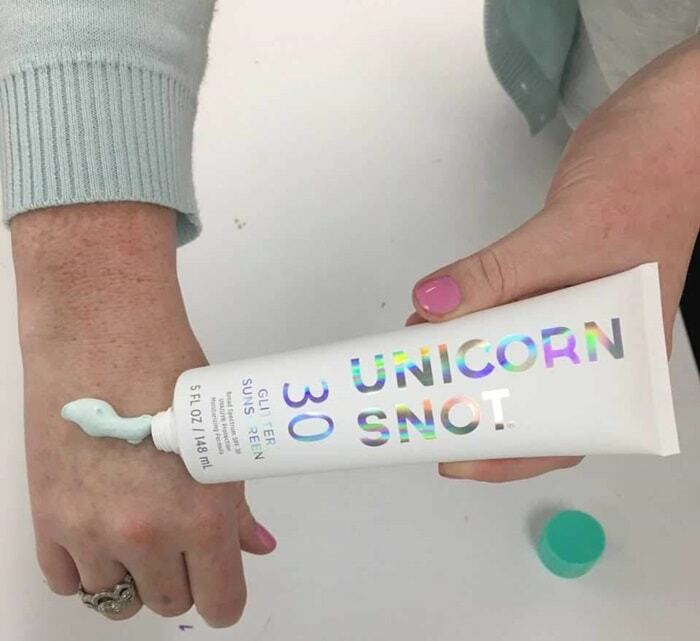 How about highlighting your inner unicorn with a one-of-a-kind sunscreen that keeps that gorgeous skin protected with a lightweight sparkle? This glittering sunscreen is available in gold, pink, or aqua blue, each with 30 SPF coverage and safe for both your feet and face. Bare feet are definitely a summertime staple. Even though they’re cute and summery, however, walking around barefoot often can cause many problems for your feet. Fungus, bacteria, and viruses often live in moist and warm places like public pools or wet grass, and these can easily be transferred to your bare feet. Washing your feet thoroughly after going for a swim or walking through a moist area can help reduce your chances of getting an infection. If you’re at the beach or at a barbecue and you decide to kick off your shoes for a while, watch your step! Look out for sharp objects like glass or cans that could damage your feet and cause further health risks. Remember, your feet are extremely important, and summer’s constant exposure can leave them battered and useless if you’re not careful! Who doesn’t love a shining set of newly-polished toes in the summertime? This is certainly the season to show off your bright pedicured feet, but even our beloved nail salons come with their potential hazards. Like most things involving feet, nail salons — and the tools they use — often are host to a multitude of harmful bacteria and germs. While most salons will thoroughly clean their tools, the summer’s high traffic makes the chance of infection much more likely. If you can’t slow down your pedicure obsession, you might consider bringing some of your own tools that you sterilize at home. Otherwise, you could try cutting back on one or two professional pedis for some at home grooming with clean tools you can trust. In addition to avoiding potential encounters with bacteria, giving your toes a break from polish every once in a while can save your toenails from embarrassing discoloration and keep them growing healthily. Try taking a day or two off a week from polish, and give your toes some time to breathe!